Some guys turn their basements into "rec. rooms" or "Man Caves". John Boutet of Grand Island made his basement a museum. It's not just "museum like". 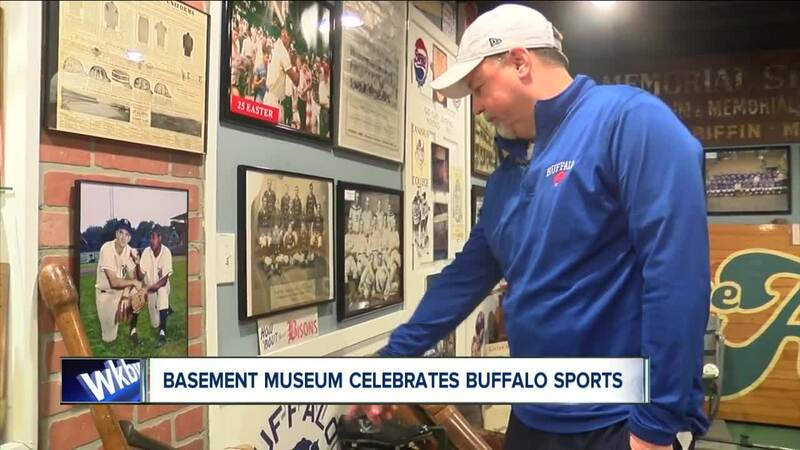 John's basement is an honest to goodness, wall to to wall, floor to ceiling, incredibly awesome museum that celebrates Buffalo sports history. John who is a physical education teacher in Wheatfield and started collecting sports memorabilia as a kid. He says "I love Buffalo. I love sports, and I love history. Put it all together and it's Buffalo sports history." He prefers vintage piece and has a wide variety of treasures from War Memorial Auditorium, the "Rock Pile" and a number of pieces from the movie "The Natural" that was shot in Buffalo. John says that he and a couple friends transformed his basement into the perfect showcase for his collection. Eventually he'd would like to have is collection be part of the Buffalo Experience. That's a planned facility that will someday house the Buffalo Sports Hall of Fame, Buffalo Broadcasting Hall of Fame and the Buffalo Music Hall of Fame. John says about his collection "it belongs to Western New York, it should stay in Western New York." GRAND ISLAND, N.Y. (WKBW-TV) — Some guys turn their basements into "rec. rooms" or "Man Caves". John Boutet of Grand Island made his basement a museum. It's not just "museum like". John's basement is an honest to goodness, wall to to wall, floor to ceiling, incredibly awesome museum that celebrates Buffalo sports history. John is a physical education teacher in Wheatfield and started collecting local sports memorabilia as a kid. He says "I love Buffalo. I love sports, and I love history. Put it all together and it's Buffalo sports history." He prefers vintage items and has a wide variety of treasures from War Memorial Auditorium, the "Rock Pile" and a number of pieces from the movie "The Natural". John says that he and a couple friends transformed his basement into the perfect showcase for his collection. Eventually he'd would like to have is collection be part of the Buffalo Experience. That's a planned facility that will someday house the Buffalo Sports Hall of Fame, Buffalo Broadcasting Hall of Fame and the Buffalo Music Hall of Fame. John says about his collection "it belongs to Western New York, it should stay in Western New York."